On October 18, 2012, the Portland FBI announced that the Oregon Financial Institutions Security Task Force (FIST) is offering a reward of $5,000 for any information that leads to the arrests of the two armed men who robbed the West Coast Bank on September 10, 2012. 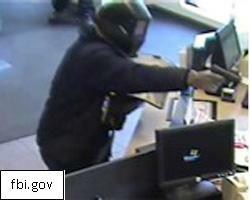 The robbery occurred at about 3:15 p.m. at the West Coast Bank on 5686 Commercial Street SE in Salem, Oregon. The first suspect stood and watched at the door as the other suspect went up to the teller’s counter, flashed a handgun, and demanded money. The men eventually left in a stolen truck, but the truck was found abandoned after a short amount of time. The first suspect is a white male in his 40s or 50s. He is about 6’0” tall, and he has a medium build. During the robbery, he wore a welder’s mask, a dark sweatshirt with a hood, and blue jeans. The second suspect is a white male in his 40s to 50s as well. The man is between 5’9” and 5’10” and he has a thin build. During the robbery, he wore dark goggles and a dark baseball hat with light lettering. He was also wearing a dark long-sleeved shirt, dark pants, and blue jeans under the pants. If you have any information about the suspects or their current location, you need to contact the FBI in Salem immediately at (503) 362-6601. You can also call the FBI in Portland at (503) 224-4181 or the Salem Police at (503) 540-2352. The FBI announces that FIST is an effort between local, state, and federal law enforcement to help protect banks, savings and loans, and credit unions. The goal of FIST is to reduce the amount of crimes committed against these financial institutions.